Any company that has ever tried to move any sort of product can tell you one thing: marketing is key! Just about every company out there can agree that marketing is one of the most, if not the most, essential aspect of increasing sales. We see marketing every day through social media, YouTube ads before videos, and in the magazines we pick up to read in the grocery store. 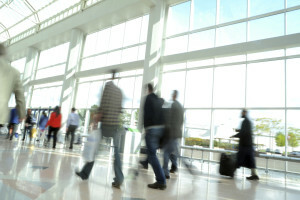 What most people don’t see being a key marketing factor are trade shows and conventions. A convention can be just as beneficial to a company as a good commercial, but that’s also dependent on whether or not the company’s booth can bring in traffic. When you’re gearing up for a trade show or convention, making sure your booth is appealing and accurately shows off your product and/or service(s) is the key to having a successful time. 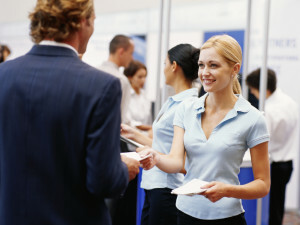 When at a trade show, there will be plenty of other vendors showing off their products and services. Make sure that your booth stands out from the crowd. These conventions are basically fierce competitions. What your company is offering potential clients may not be enough to bring in those passing by. Naturally there are many different mitigating factors that can play a huge part in your company’s success at a trade show. So what are some of the ways that you can help increase booth traffic at your next trade show? Take a second to think about before the trade show even begins. Why not try to get ahead of the crowd and contact the registered attendees? Most trade show organizers will happily give you a list of the registered attendees of the upcoming event, so why not take advantage? By contacting these potential customers before the trade show even takes place, you’ll be able to build buzz upon your brand and your booth early, thus guaranteeing early traffic. Emails are naturally the fasted way to go, but there’s nothing wrong with a good ol’ fashioned postcard or letter in the mail. You get to avoid the spam filter and having an oddly colored or oddly shaped postcard in the mail will definitely stand out from the standard white envelope bill. Offer some sort of incentive at your booth. If there is anything I’ve personally learned from attending conventions and trade shows, it’s that people love anything that’s free. By giving away free samples of some of your best-selling products, or some other type of free swag that represents your company, you will easily gain more traffic at your booth. People will be guaranteed to come back. Naturally, if your booth is crowded or sees that you’re offering something for free, they will stop to see what you’re all about. The free items don’t even need to be something directly from your company. They can be anything from the typical pen to a frisbee or a keychain. Everyone loves free! Why not looking into making your booth a bit more of a relaxing place for your potential clients. Why not add a charging station to your booth. We all know how attached people are to their mobile devices these days, whether that be a smartphone, tablet, or laptop, so why not cash in on that? If you offer something like a bottle of water, a chair, and a charging station, you can be sure that your booth will be seeing an influx of traffic. When your potential clients are in a more relaxed environment, they’ll be much more likely to sit and listen to what your company has to offer. Make your booth eye-catching as well! Having monitor displays set up to show off a hype reel of what your company is offering can definitely catch people’s attention. There is also the option of getting a beautiful backdrop display showcasing your product. Why not add a small competition or game to your booth and offer a product directly from your company as the prize? People like free and people like winning! There are nearly endless possibilities that you can use to your booth more successful at your next trade show. Use these ideas as a guide and think of more on your own to make sure that your booth is generating the most traffic at your next event! This entry was posted in event tips and tagged conferences, conventions, Events, Trade Show, trade show secrets, trade show tips. Bookmark the permalink.